"Spring Again: an evening with the Arch Street Irregulars at the Hurds' house"
"Concert for Helen Rand Parish"
"L'Amour, la mort, et la vie" - A Summer Concert at the home of Olivia & Thatcher Hurd. 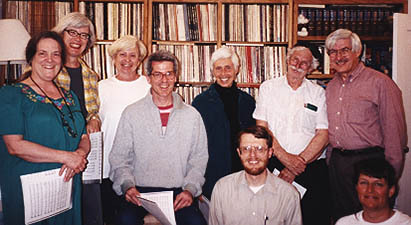 "Christmas, Carols & Chromaticism" [selection from upcoming program": A Winter Concert at the home of Heather and John Irons, in honor of Willa Wilson, visiting Canadian organist, choral director and singer [and Heather's mother]. "Renaissance Music: Instrumental & Choral"
This page maintained by Bill Whitson (bwhitson@choralarchive.org). Last update 12/14/04.